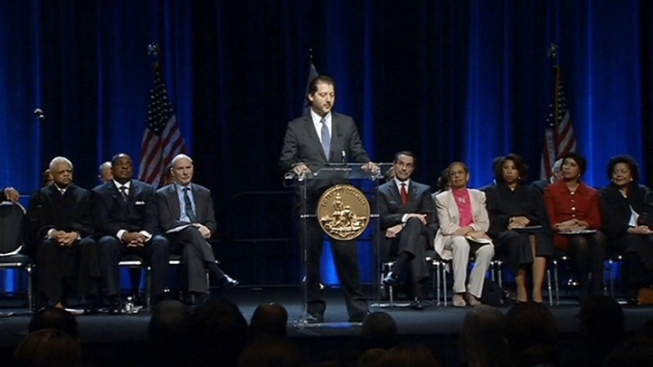 Six members of the D.C. Council were sworn-in during an inauguration ceremony Wednesday morning. Independent David Grosso was the only new face; he beat out incumbent at-large member Michael Brown in November. Grosso said ethics reform will be his top priority and that he looks forward to a day when the council is "beyond reproach'' on ethical issues. Re-elected council members Vincent Orange, Jack Evans, Muriel Bowser, Yvette Alexander and Marion Barry are also beginning new four-year terms. Former Mayor Barry will be 80 years old when his term ends. In his remarks Wednesday, he touched on his impoverished childhood in the segregated South and credited hard work and faith for his accomplishments. The council will be getting some other work done today: Members will be assigned to committees today during an organizational meeting. Meanwhile, Brown says he will attempt to return to the D.C. Council, this time as a Democrat. The D.C. Board of Elections says Brown picked up nominating petitions Wednesday for a special election in April. He has three weeks to collect 3,000 signatures from registered District of Columbia voters in order to appear on the ballot. Brown was elected in 2008 to a seat reserved for members of non-majority parties. Now there's another at-large seat open, the seat once occupied by Phil Mendelson. Mendelson is now D.C. Council Chairman and Brown has changed his registration back to the Democratic Party to run for the seat. Brown is one of 14 possible candidates who have picked up petitions.